By now you probably know that Microsoft has released Windows 10, probably because it has shown up in your ‘Windows Updates’ notifications. In the corporate world, system administrators most likely have disabled the download and auto-upgrade of Windows 10. So their question becomes, To upgrade or not to upgrade? What I will try to do here is to go over the pros and cons of the new OS based on our team’s observations and evaluations. First a bit of history. A pattern is emerging from Microsoft. They released Windows Vista back in 2007. It was supposed to be a revolutionary change in the way desktop OS was used and managed. Everybody—both consumers and corporate America—hated it. It was buggy, nothing ran right, and it was hard to manage in networks at the time. Everyone chose to stay put with Windows XP, as it was very stable and easy to set up on corporate networks. Soon the outrage grew so strong that Microsoft had to act. So they came out with Windows 7, which was everything Vista was supposed to be. And life was good. Not being one to simply improve on a good thing, Microsoft again created a totally “new and revolutionary concept” with Windows 8. Deja Vu all over again. Windows 8 was universally hated, mainly because it’s Metro interface was very hard to navigate, essentially requiring a tablet or touch screen to navigate properly. One of the biggest outrages was the missing Start button. So to appease the masses they came out with version 8.1 (a service pack), which among other things restored a sort of Start button. But the damage was done: corporate America shunned it and that was that. Following this dubious tradition (or precedence), Microsoft has come out with a totally reworked Windows 10 (Hmm .. what happened to Windows 9??) and has made it available for free to anyone who has Windows 7 or above. Why free? We will get to that in a second. But first, let’s return to our original question: To upgrade or not to upgrade? Windows 10 has a much improved interface over Windows 8. It is more like Windows 7 with the Office 2013 ‘Metro’ look and feel. Back is the Start or Windows button in its familiar location. But the look and feel is updated to match the Metro scheme, and some functionality has been added. It has literally hundreds of settings to display items any which way you choose. Windows 10 better integrates with corporate networks. However, you do need to pay close attention when setting up a fresh install, as it asks if you will be a home user or a corporate user. (In an upgrade scenario this question does not come up. It assumes if you are already on a corporate network, it can set itself up accordingly.) But on a fresh install or an out-of-box setup, there is no easy way to change your selection. Gone is the block style ‘Metro’ home screen (unless you opt for that by invoking Tablet Mode) so that existing corporate users will have a familiar desktop experience and minimize the culture shock. Under the hood, Windows 10 maintains the same functionality as Windows 7, and most of the management apps (Computer Management, Control Panel and Administrative Tools) are the same. Management from an IT perspective is mostly the same. Windows 10 in existing corporate networks will use Windows 7 group policies, but you can bet there will be schema upgrades for corporate networks for all the new settings in Windows 10. We did experience some idiosyncrasies as it relates to the new Edge browser. Most of this is attributable to the fact that the third-party plugins have not been upgraded for the new browser. They still have IE11 installed, but with no icon created. It is a choice if you change the defaults page for browsers. Or you may install Mozilla or Chrome, as both work just fine. Finally, security is enhanced. Windows Defender, while still an immense resource hog, has updated capabilities and does a reasonably good job of deflecting virus and spyware. However, Windows Updates are activated by default with NO way for it to be disabled, although group policies that disable updates will still work. But Microsoft wants you to do the updates so it forces it’s will on you in that regard. The good news is Corporate IT can still manage that and push out updates using WSUS as they always have. Also, virtually all existing AV and Spyware filters will work as on Windows 7. 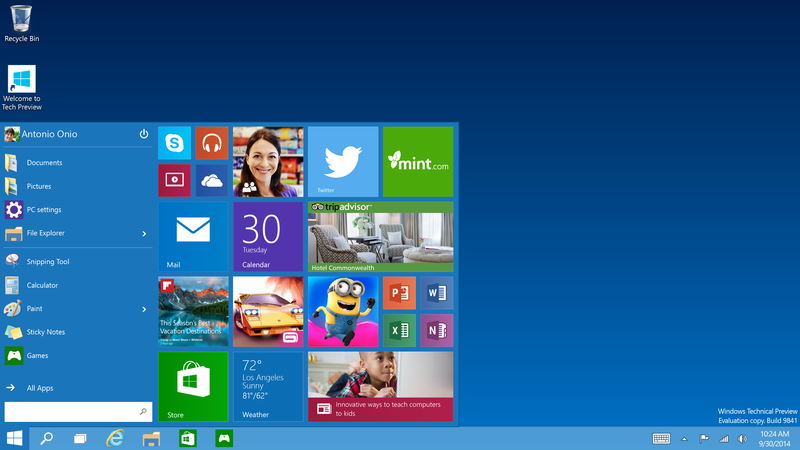 OK, so Windows 10 is available for EVERY user using Windows 7 and above – for free! (Used to be that the upgrade was available only to users who bought a new PC or OS in the last 6 months.) The upgrade is pushed out as an option when Windows Updates checks for updates. This begs the question, “Why would Microsoft give it away for free?” Might there be an ulterior motive? They neglect to add something more nefarious for the future – advertising. Because in each application there is room for ads, especially in Cortina and Edge. Microsoft can use all that metadata and sell it to have the possibility of advertising. You can see the beginnings of it already in the ‘notifications’ window. Previously the notifications window showed only system status. Now it conveniently is hooked to Edge, and displays news stories according to information gathered from your browsing history and possibly from other applications as well. The same applies to the ‘Play and Explore’ block in the Metro screen off the start bar. Can advertising be far behind? My suggestion would be to get a free app here that displays the 33 most used ‘spy’ settings and helps you to disable them. Also search online for more settings to disable to minimize the reporting of user metadata to Microsoft. Overall this is a worthy upgrade, but keep one thing in mind: The first version of any OS is bound to have issues. If your internal IT can handle some surprises then I would recommend this to Corporate America. Just make sure to stagger the upgrades – first to test pods, then to power users, and then phase it in to your user base over a period of months. And definitely keep its patches up-to-date, as it looks like any service patches and fixes will arrive that way. Lastly, be aware that because of the high demand, Microsoft is basically taking reservations to limit the massive hit of all those users requesting the download. Because of that, malware makers have seized upon mankind’s propensity to try to ‘cut in line’. There is a variant of Cryptolocker called ‘CTB-Locker’ that pretends to be a full version upgrade download but in reality is just the variant launcher that encrypts your files. This currently is delivered via email spam, but future variants may come in Spyware. Just remember there are no shortcuts to upgrading.